Spool Blocks have been keeping me busy this week; inspired by issue no. 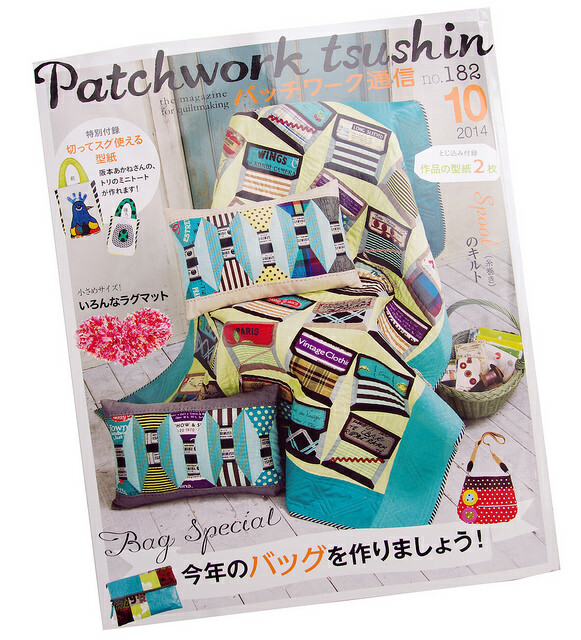 182 of Patchwork Tsushin, a Japanese patchwork magazine. I purchase this magazine every so often just for the pretty pictures; it is always filled with projects that inspire. 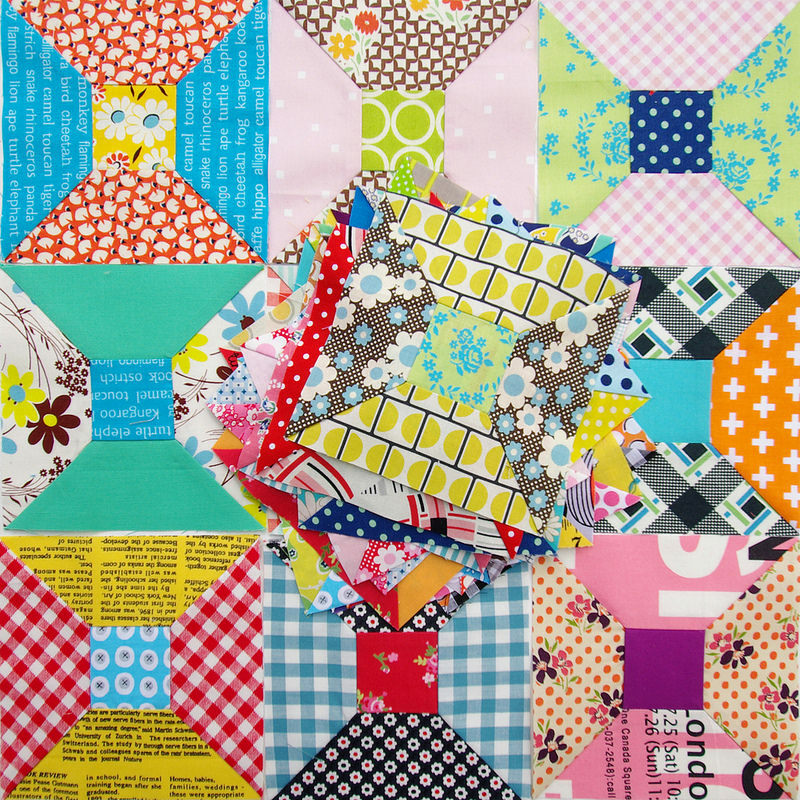 This issue features lots of bag projects but also several quilts made with variations of the Spool Block and the not dissimilar Butterfly Block. All of the instructions are in Japanese and in addition all measurements are in centimeters rather than inches, which makes following a pattern somewhat tricky, but the basics are all there. 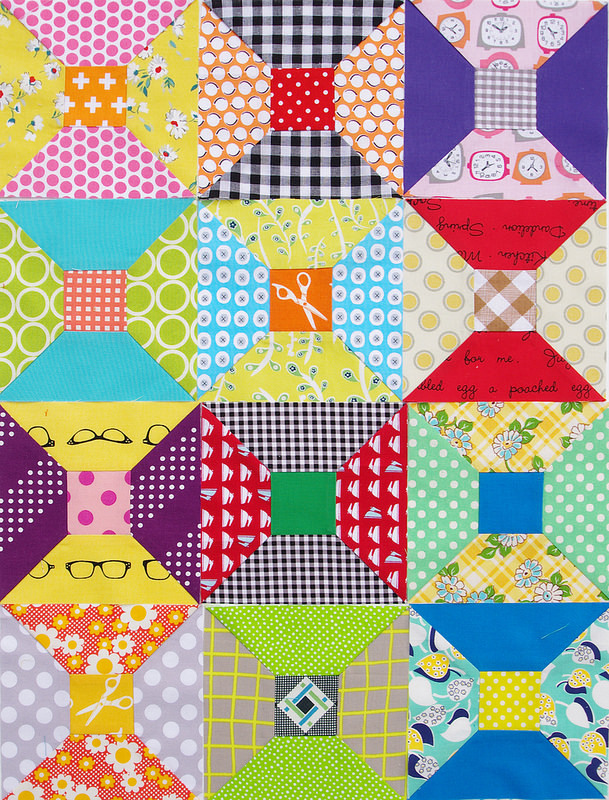 I have previously made a Butterfly Block Quilt (and have written a Butterfly Block Tutorial) and the image above made me want to start another Butterfly Quilt, but at the last minute I changed my mind and tried out a Spool Block. I drafted a Spool Block using EQ7 (quilt design software) and printed templates to cut the fabric pieces. My finished block measures 5 1/2" including seam allowances, although with EQ7 you can print templates for whatever size block you choose to make. You can easily piece this block with squares and half square triangles however I designed my Spool Block with inset seams (Y-seams). Inset seams are not difficult (although it is slower than chain piecing) and they do eliminate eight seams from this block. 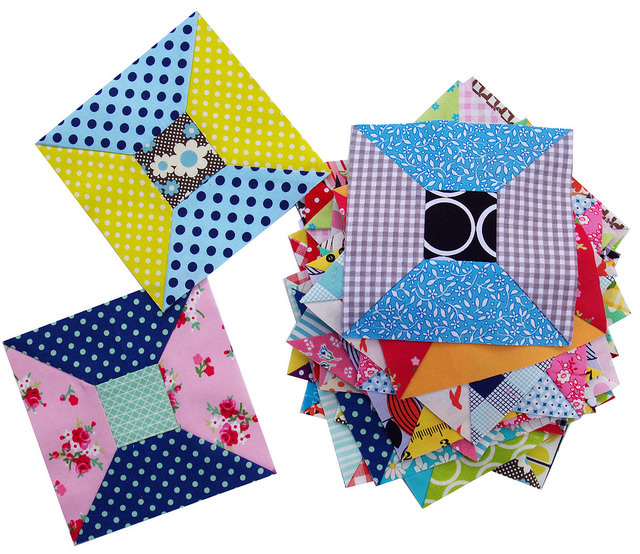 All of my blocks are machine pieced. So far I've made 40 spool blocks and I have cut fabric for an additional 10 blocks, ready for sewing. 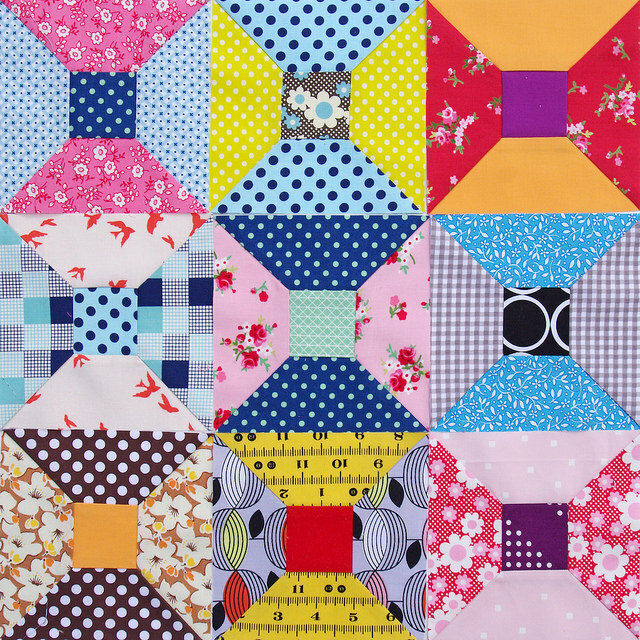 More blocks are needed and I am trying hard not to over think the fabric and color combinations. More. More. Just cut and sew. How fun is that?? The magazine looks like it's filled with lots of pretties. So bright and colorful. Gorgeous. And I think the Y seams are worth it as you keep your prints in tact - with HSTs I think the blocks could look too busy with the extra seams/prints not meeting. I must have a look at this mag one day - I saw that Ayumi has some darling little dresses in there. Almost makes me clucky. Almost. I'm intrigued by those tall skinny spools. Just when you think there is nothing new under the sun . . . So cute. I love the bright and cheery colors. Your colour combinations are fabulous. I love anything you do, and these spool blocks are no exception. Can't wait to see them finished. This is such a lovely quilt! Your fabrics just MAKE it zing. Fabulous! How darling! Your colors and fabrics are so fun!! What fun -- and your Y seams are perfect, of course! This is soooo nice. Look forward to seeing it finished. Love the scissors in the center of that one spool. Nice work! 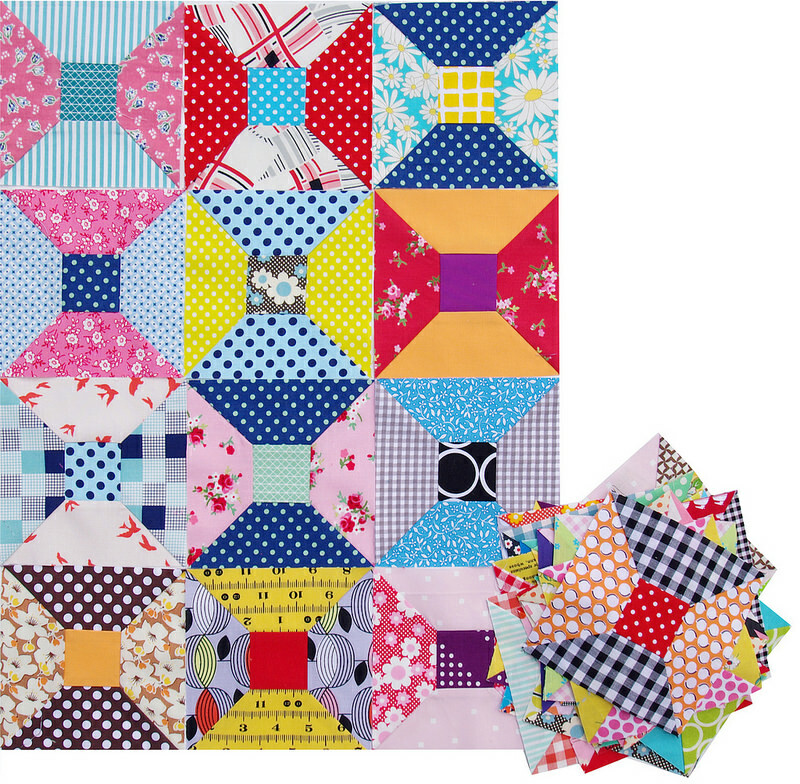 The block with the little pair of scissors in the middle is just so cute! I can see why you like that magazine - it loks great. Cute blocks!! 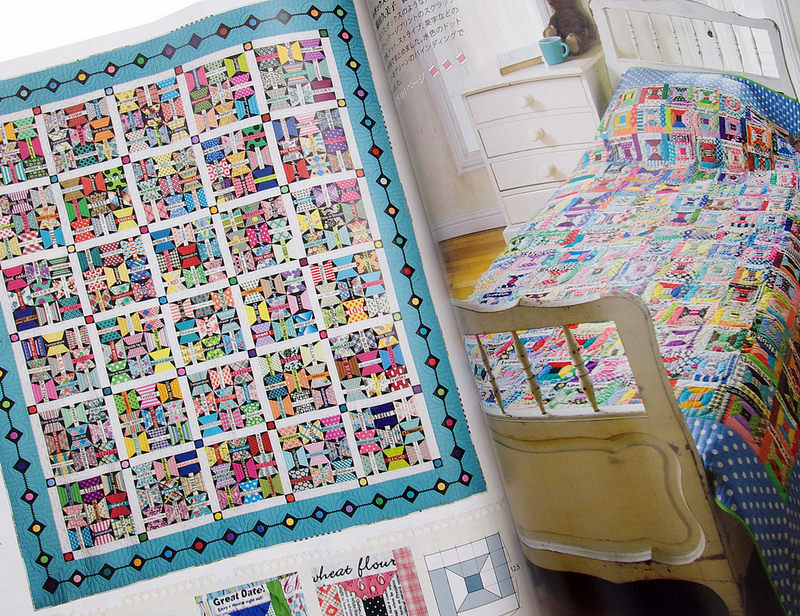 The Butterfly quilt looks darling too! Your work always impresses me - love these spool blocks! I cannot begin to describe how much I love this quilt and how happy it makes me! I always feel more empowered when choosing my fabrics because of you!